World Unite supports the Hajrat Nhal Primary School in the village Hajrat Nhal, which was awarded an international “green” label for incorporating environmental education and awareness activities as an integral part of the curriculum. The students are taught concepts such as the fight against desertification, renewable energy, and water and resource use. In addition they learn about the preservation of fauna, flora and cultural heritage, and sustainability and awareness of nature and the environment. These topics are not usually addressed in public schools. The families from the rural area of the village are generally of low-income and low-educational level. 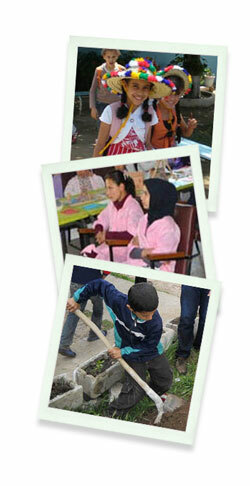 The school works to actively involve parents of students and their families in their environmental initiative. The village is located in the nature reserve “Lac Tahaddart,” about 25 km outside of Tangier, which is a wetland with rich biodiversity – an important refuge for many birds such as bustards.